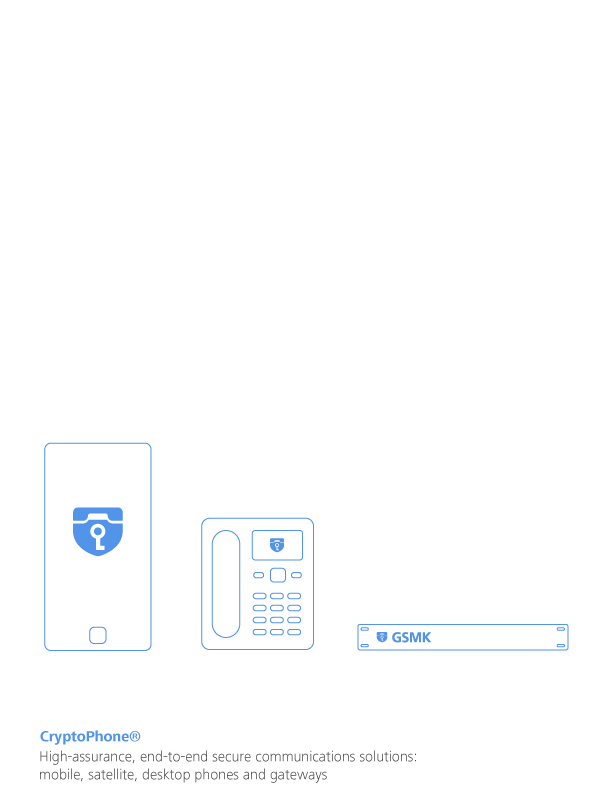 GSMK designs and manufactures end-to-end encryption systems, terminals and software that allow secure, reliable and user-friendly communications across network borders. Our unique 360° approach to mobile device security manifests itself in the GSMK CryptoPhone® product line of secure mobile, desktop and satellite terminals that offer strong end-to-end encryption, protection of meta data, and a hardened operating system that protects our secure mobile devices against attacks from the outside. GSMK pioneered the secure mobile device market by introducing the world’s first secure smartphone with end-to-end voice encryption back in the year 2003. To this day, GSMK CryptoPhones continue to represent the gold standard when it comes to trustworthy secure telephones. They have become iconic symbols of how it is possible to retake control over the confidentiality of telecommunications, having played a prominent role in parliamentary debates about telecommunications privacy as well as numerous newspaper articles, books, movies, and TV series. GSMK CryptoPhones are part of, among others, the permanent collections of the Victoria & Albert Museum in London, the German Museum of Technology in Berlin, and the Science Museum London. They continue to protect the confidential voice calls, data, and messages of a wide range of individuals, corporations, and institutions in over 50 countries worldwide. GSMK CryptoPhones are the only secure telephones on the market that come with full source code available for independent security assessments. They feature the strongest and most secure encryption algorithms available today as well as the longest key lengths available on the global market, thereby offering true strategic security and peace of mind today and in the future. GSMK CryptoPhone secure mobile, fixed-line and satellite phones use latest-generation voice codecs and are fully compatible so that encrypted calls can be made across network borders – mobile to mobile, mobile to fixed-line, fixed-line to satellite, all with seamless interoperability. With a 4096-bit Diffie-Hellman key exchange and 256-bit symmetric encryption using two independent crypto algorithms, AES and Twofish, in parallel, they reliably protect confidential calls and messages without any compromises in usability. Secure international messaging comes standard with special features like self-destructing “Eyes Only” messages. A truly secure communication device must not only protect its communication links, it must also be able to withstand attacks against the device itself. To achieve this, all GSMK CryptoPhones are based on a “hardened” operating system with granular security management and streamlined, security-optimized components and communication stacks. The hardened operating system reliably protects the device against outside attacks, thus offering true 360-degree protection when it counts most. GSMK CryptoPhone secure mobile phones also come with an encrypted storage system for contacts, messages, and keys. Smart folders protects confidential data against unauthorized access should the phone be lost or stolen.